A couple of years before I joined Burroughs, Ray McDonald, the legendary CEO of Burroughs, retired. Ray was the guiding force that propelled Burroughs from a mechanical adding machine company into a digital computer powerhouse. 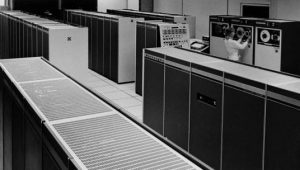 If you look at the companies entering the computer field in the 1950’s, you would not have guessed that after IBM, Burroughs would emerge as the leader. After all, Burroughs was an adding machine company! Electronic giants like RCA, General Electric, Honeywell, Motorola, Philco and a host of others were all in the game. Even though there were a lot of companies in the business, they were all basically copying the UNIVAC design, the register based Von Neumann architecture. Ray felt that Burroughs could not compete by just copying. Burroughs needed something unique, so he encouraged internal engineering competition. Ray believed in competition, even within the company. As a result, several mainframe computer architectures were explored, and in the end three were brought to market, the E-mode B5000, the decimal B2000 (actually beginning with the B220 from Electrodata) series, and the bit addressable B1000 series. None of them were like anything else on the market. The B2000 series, developed in Pasadena, was an immediate hit. 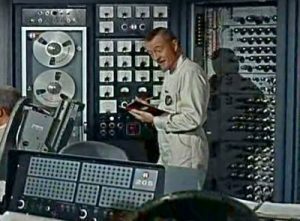 In the early days of computing, mainframes were little more that large, programmable business calculators. They crunched numbers, mostly decimal numbers. Shortly, COBOL became the standard for business computational programming. The B2000 series was to COBOL what the B5000 was to ALGOL. It executed COBOL code almost directly. The B1000 series, developed in Santa Barbara, was designed to bring the cost of computing down by using main memory much more efficiently. In these days of multi-gigabyte main memory smartphones, it is hard to remember the very high cost of memory up until the very end of the 20th century. High memory cost was a major roadblock to reducing computer cost so small businesses, let alone individuals, could afford a computer. After Ray retired Paul Mirabito was chosen as CEO. He was a finance guy. He was really chosen as a caretaker since Ray had not really groomed anyone for the top job. So Burroughs became more cautious, and oriented toward cost savings. Central Engineering in Detroit was given more power. One result of this drive for cost savings was that an edict came down to standardize logic families for all mainframes. The new logic family was BCML “Burroughs Current Mode Logic” (logic is the hardware chips used to build a computer). 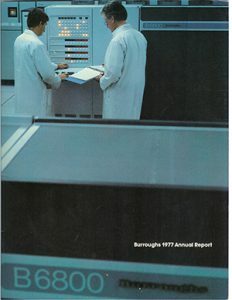 A few years before I joined Burroughs the company had purchased a small semiconductor manufacturer in Rancho Bernardo, CA. In the mid-70’s all computer processors were designed using bipolar logic. CMOS (Complementary Metal Oxide Semiconductor) logic, which is the basis for today’s processors, was very slow and not very dense in the mid-70’s. CTL (Complementary Transistor Logic) and TTL (Transistor-Transistor Logic) were the most popular bipolar logic families in the late sixties and early 70’s. Both logic families had a standard catalog of parts, and multiple vendors, the largest being Texas Instruments and Fairchild Semiconductor. By the early seventies designers needed more performance. TI and Fairchild developed ECL (Emitter Coupled Logic), which really was designed primarily to replace CTL because of power and design complexity issues (the more expensive and faster of the two logic families). TTL would remain the choice for lower cost but more highly integrated designs because it used less power. By the time the B6900 was to be designed, ECL was a well establish logic family with impressive performance. In fact, as a graduate student at MIT I had used ECL in the design of a signal processing computer, the SSP or “Black Box” (see Allen J., Carroll F.X., Jensen E. “The Black Box, being a small, fast digital processor designed mainly for speech synthesis but nicely suited for myriad other tasks”, MIT Internal Document, 1975). Because ECL did not have dense memory components, I used TTL memory, with TTL to ECL converter logic.